They are all less than five inches and they will each make me smile scattered around the house. I love the pretty brass swans (?) especially the one with her head raised high. And who wouldn't love a glass pineapple? I just had to get the little mallard because it reminds me of my grandma. My grandparents used to always have mallards scattered all over their house in upstate NY. As a kid they sort of fascinated me.. I had to pick up this little guy because it made me smile. 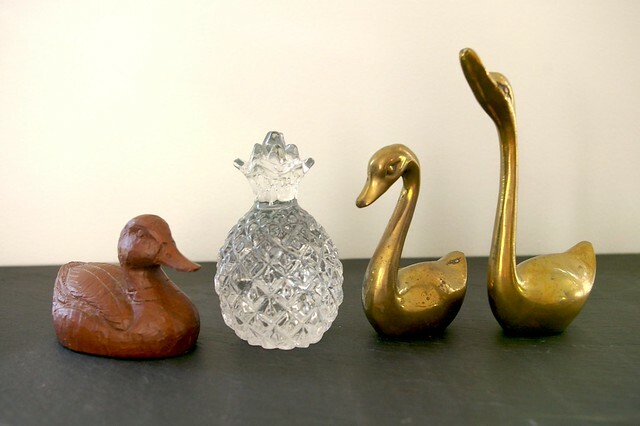 Oh cute, I have the exact same brass swan (second in from the right) also from a thrift store. Lovely finds! In Virginia the pineapple is a sign of hospitality!! 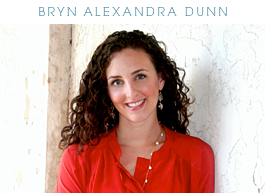 Darling Bryn, I am right there with you on the messy house. I am doing crazy cleaning this weekend, too, and am always mortified that I don't have any kids to blame the disaster on---it means that the hubby and I are to blame! Oddly enough, about a month ago, I found a pair of swans that are very similar to yours! They're heavy brass. Love your little finds. I adore all things animals in any form in any design!! Awwww! I thought of my grandparents too when I saw the Mallard. They had a bunch! I love the swans! I just saw one that was about 12" tall on Craigs for crazy money. Good score! I have a weird obsession with brass animals right now! I was hoping to add brass lion ring pulls to my cabinets, but the ones that arrived were all wrong. So sad. Went with an animal lamp instead. I think both would have been overkill... but figurines are easier to mix and match! Lovely Bryn especially the brass swans! We are also having an issue with keeping things clean. With just the two of us (and no pets!) you would think we could handle it.....but busy days keep us from thinking of the little stuff. Then it all piles up! I love the brass swans. I need to get myself to the thrift stores this weekend. We are off to look at more houses and hoping to actually buy one this time! I have the glass pineapple myself! I picked it up in Williamsburg, VA. They sell lots of things with pineapples, especially around Christmas – apparently it’s a symbol for hospitality. Today is cleaning day at my house, too. And laundry day. Piles and piles of laundry! I am loving brass everything at the moment, so the swans are bang on for me!